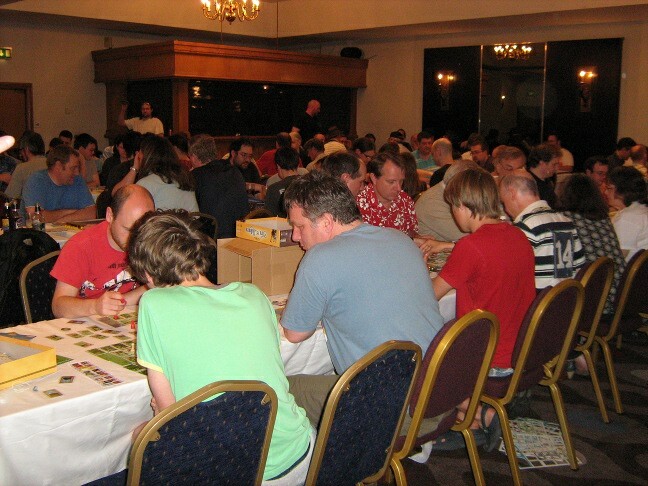 UK Games Expo – 10pm and still going strong! It’s Wednesday, and I’m waking up in Deepest Darkest Normandy for the first time since the awesome UK Games Expo roadtrip, filled with ideas, buzzing from meeting so many chums and awesome folks, and thoroughly inspired and recharged for another stint at the RPG writing coal-face. What a great convention! I think this was my best UK Games Expo yet. 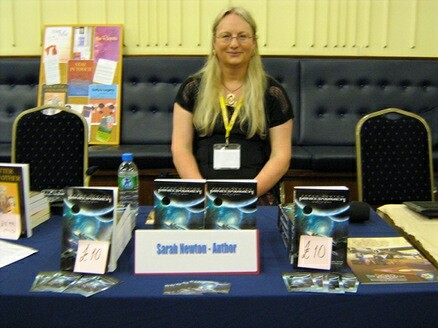 For the first time I was there as an independent freelancer – I had a table up with the New Writers UK team, where I got to meet the very wonderful John Denning (father of Richard, organizer of the con and stalwart con supporter), and Marilyn L Rice and Nick Marsh, two fellow fiction authors with whom I shared the “Pathways to Publication” fiction panel on Saturday afternoon. Hi guys! Yours truly before selling out of “Mindjammer”! It was a packed convention – and business was exceedingly brisk. I managed to sell out of my entire stock of 22 copies of my Mindjammer novel by 4pm on the Saturday, leaving me with no stock for the Sunday – an awesome and completely unexpected result! Thanks everyone for buying – I hope you enjoy the read. Next time I’ll be sure to stock up with considerably more copies! Fun for families of all tribes! In many ways UK Games Expo is the perfect games convention: you get to meet up with fellow gamers and chat directly with the people who buy and play your games, finding out what they like and don’t like, and connecting with people in a way you rarely can online; but also it’s very well attended by industry folks, with plenty of downtime for having a jar in the pub or a jaw in one of the many eateries around the Clarendon Suites in Brum. This year it was great to meet old friends and also make a ton of new ones, including putting names to faces I’d previously known only online. Shout-outs to Dave Blewer and Kevin Anderson at the Triple Ace Games stand, Dave McAlister of UK Roleplayers, and Neil Rennison of the awesome Tin Man Games, who’s doing some awesome things with RPGs and iPads and Androids. Great to meet you guys! It was also great as ever to meet with Robin Elliot on the Triple Ace stand, and bag his latest game, Leagues of Adventure, written by the prolific Paul “Wiggy” Wade-Williams, author of Hellfrost and the Cthulhu Avalon sourcebook, amongst many, many other things. The Triple Ace stand is always a thing of beauty; finely crafted and very professional. This time I was particularly impressed with the triplet of Hellfrost dioramas the guys had set up as demo podiums around the Triple Ace stand – very attractive, and a great way to demo the setting. Kudos! I was also very impressed by Tin Man Games, and its owner Neil Rennison, a truly great and friendly guy. Tin Man are responsible for the new “Choose Your Own Adventure” books now available on iPad and Android, which I’d heard plenty about online but had never actually seen in action. I chatted with RPG stalwart Nick Robinson and prolific fiction author (and fighting fantasy guru) Jonathan Green at the Tin Man stand, both of whom walked me through their apps, and was truly impressed; there’s a whole new strand of RPG awesome developing there, and I’m looking forwards to following their developments very closely. I grabbed a copy of Temple of the Spider God on my return to Normandy, and am looking forwards to playing! It was great to catch up with Angus Abranson, too, and check out his new Chronicle City venture. Lots of great chats there, but also the opportunity to see the physical version of Nimrod Jones’ Faustus card game at at last. I played this at IndieCon a couple of years back and was very impressed – it’s a great game of demons and sorcery – and so was very interested this time to see the physical pre-production version. All being well that looks to be being launched by Chronicle City very soon – possibly even before Christmas – and I for one will be queueing for a copy. Great work guys! I must of course mention Chris Birch, my co-conspirator on many RPG projects over the past few years (not the least Mindjammer and Legends of Anglerre), whose new imprint Modiphius is publishing my new Zero Point campaign for the Achtung! Cthulhu line. The first Zero Point adventure, Three Kings, launched last week, and it was great to sit down with Chris and discuss upcoming Modiphius projects – watch this space! Gill Pearce of Hellion’s Art. Arrr! I also had chance to meet and chat with Gillian Pearce of Hellion’s Art, who’s one of my favourite RPG cartographers at the moment – her isometric maps in particular are an absolute delight, original and effective. We used her maps in the Legends of Anglerre Companion, and she regularly graces Moon Design’s excellent Gloranthan publications. I look forwards to seeing more of her work as the years progress. Likewise the indomitable Paul of Cthulhu of Yog-Sothoth.com fame, whose infectious enthusiasm for all things Cthulhu regularly graces our cons. Great to see you, Paul – and I hope you like Achtung! Cthulhu! I also managed to sit down and have a great chat with Pookie of Reviews from R’Lyeh, too, comparing notes on all things RPG and Cthulhu. Pookie’s one of the best RPG reviewers I know – insightful and honest, and very thorough, with an exceptional eye for detail – and I’m looking forwards to seeing his future endeavours in the RPG sphere bear fruit. 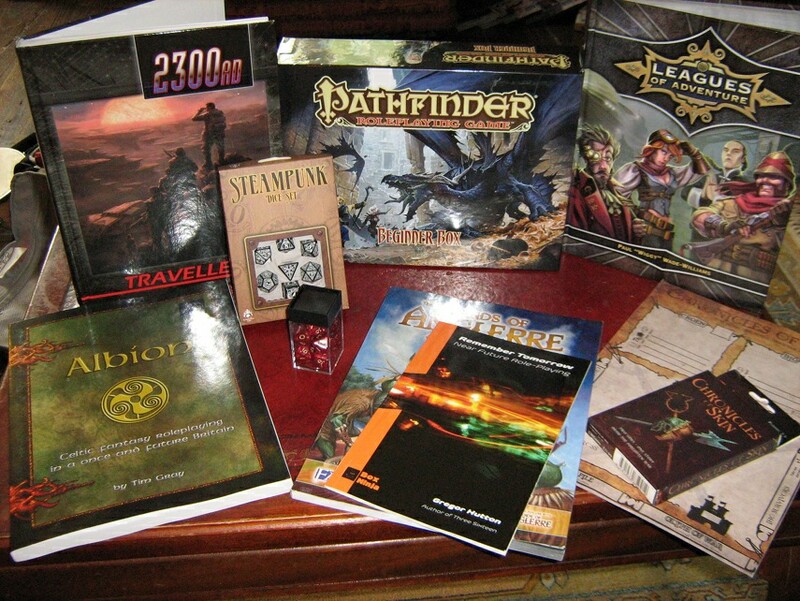 I took part in two seminars this UK Games Expo: the RPG Designers panel, with Angus Abranson and Ben Counter, chaired by Paco Jaen of GMS Magazine fame; and the Pathways to Publication authors panel, with Marilyn L Rice and Nick Marsh, chaired by Jane Denning. Both were excellent: Paco’s RPG Designers panel took the unprecedented step of giving the three of us the floor for 15 minutes apiece, which truly allowed us to say something meaty about designing RPGs, and I for one found Angus’ and Ben’s comments very useful, and I hope the panel was useful to the many attendees. The fiction panel was also great fun: each of us did short 5-minute readings from our novels, and I was particularly impressed by Nick Marsh’s awesome Italian accent, interspersed with faultless dropping out into cockney and northern accents. Kudos Nick! So, a great convention all round. Next year UK Games Expo will be taking place at Birmingham’s NEC. It’s a little sad to be leaving the quirky halls and corridors of the Masonic temple in the Clarendon Suites, but this year showed that the con is rapidly outgrowing its environs, and needs more space to breathe. I hope to be there for the 7th UK Games Expo, mingling with the ever increasing crowds of friendly gamers, families, daleks, cyberfolk, jedi, stormtroopers (even including R2D2 Kenny Baker this year), enjoying an excellent weekend of convivial mayhem! Cheers to everyone for a great event, and see you next year! ← Off to UK Games Expo 2012 – see you there! Ahem. We are actually moving to the Hilton Metropole at the NEC complex.